Thus begins an ambitious and very entertaining story of a “shadowy government agency” and the havoc it wreaks. Writing from Victorian London, Dr. Stokes records in her journal the events bringing her to that specific time and place. In the current year, she is minding her own business as an “exploited and downtrodden humanities lecturer” at Harvard University when she quite literally runs into a young man emerging from a nearby office. The next thing she knows, he’s taking her for coffee. He’s Lt. Col. Tristan Lyons, young, personable man even in civilian clothing, and he likes Mel’s looks as well as her qualifications. Tristan explains he’s part of “a shadowy governmental agency” called D.O.D.O., the Department of Diachronic Operations, and he’d like her to translate some documents for them. According to Tristan, in the year 1851, magic ceases to exist, replaced by technology. For reasons unexplained to others except on a need-to-know basis, D.O.D.O. wants to restore magic to the world by going back and stopping its destruction. Before she knows it, Mel finds herself an enthusiastic participant in a journey through Elizabethan London, the sack of Constantinople, and various places before, after, and in between. With the aid of a physicist laughed out of the science community for espousing such a theory, Tristan builds a chamber inside which magic can exist. Eliciting the assistance of two witches—Erzebet, from 19th century Hungary, recruited by Mel in a past she doesn’t remember; and Gráinne, found by Tristan in Elizabethan London—they begin the task of traveling to specific moments in history with the intent of changing them for the purpose of influencing the present. There are comic events as well as tragic ones as the travelers find them in situations for which they aren’t prepared. Specialists are enlisted, training them in speech, customs, ways of dress, as well as methods of combat. More and more witches become involved, with a few accidentally transported civilians, and from those instances, the danger evolves. The regimented heads of the agency regard anyone not from their own time as too unintelligent to grasp what they intend. Keeping the witches in the dark is definitely a big mistake. Between them, Erzebet and Gráinne form their own pact dedicated to finding out all they can and to saving magic in their own way. Unfortunately, this involves getting rid of certain people and obstacles, including Tristan and Melisande. At this point, everything turns into a giant set of dominos toppling madly in all directions. . . . The Rise and Fall of D.O.D.O. is by turns, a scifi tale, a political satire, a colossal comedy of errors, and a very slowly percolating romance. Thought-provoking as well as entertaining, it contains some anachronistically amusing situations, a tragedy or two, witty dialogue, and two very likable main characters. The obvious literary significance of the hero and heroine’s names will be blatantly apparent to the classical reader while the reconstruction of various eras will appeal to the historian. D.O.D.O.’s acronym is also telling, as all definitions point to an ineffectual something no longer in existence. Dialogue, characters, and situations notwithstanding, the novel suffers from one flaw: it’s too long . . . 749 pages. By the time the reader reaches the end, he’ll have forgotten the plot. Perhaps the authors recognized this and that is why a Glossary and List of Characters is included. Nevertheless, dividing this novel into several volumes would’ve made it an easier and much more memorable read, and possibly avoided the very abrupt ending. Indeed, it appears the authors simply realized they had to stop somewhere and immediately did so. 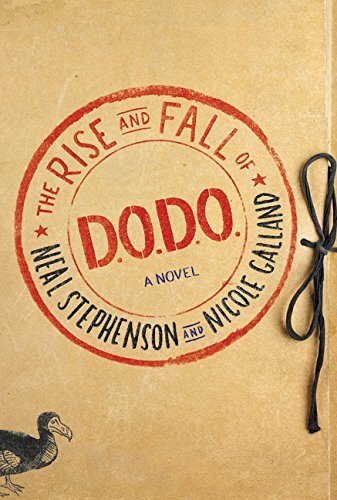 Even those readers having a general dislike of time travel stories will enjoy reading The Rise and Fall of D.O.D.O. They, along with others, will undoubtedly hope its conclusion points to a (much shorter) sequel.